In this lesson, we will learn how to subtract three-digit numbers without regrouping and how to apply this skill in real-life situations. How much less than 961 is 278? A man has 8 0 0 p o u n d s . He gave 7 0 0 p o u n d s to charity. How much money does he have left? A boy saved 3 2 7 p o u n d s . He bought a bicycle for 1 1 4 p o u n d s . How much money does he have left? By how much does 532 exceed 202? Complete the diagram below by following the arrows. 2 5 8 − 2 0 0 = . Shady has a fifty-pound note and seven pounds. Dina has two ten-pound notes and six five-pound notes. How much more than Dina does Shady have? Use 6 2 6 + 3 0 6 = 9 3 2 to fill in the gap: 6 2 6 + 3 0 6 − 6 0 0 = . Subtract 2 tens and 3 ones from 437. 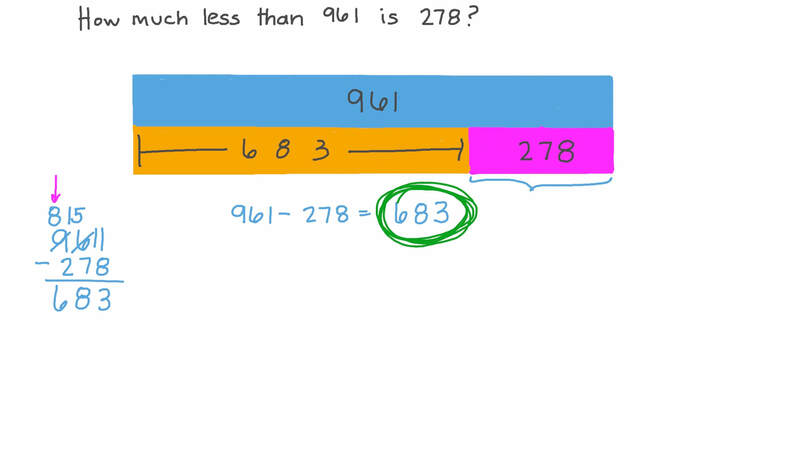 Hint: Use the place value blocks if you need to.